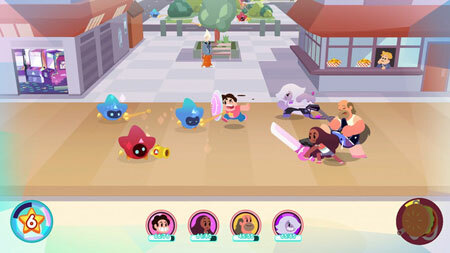 Steven Universe: Save the Light is a unique action RPG from Grumpyface Studios, Finite Reflection Studios, and it combines real-time strategy and turn-based combat. A mysterious new Gem has stolen a powerful weapon. Only Steven and his friends have what it takes to stop her. Completely customize your party. Fight an army of light as Steven, Garnet, Pearl, Amethyst, Connie, Greg, and Peridot. Bust out unique abilities to solve puzzles and battle the bad guys. Face off against an all-new Homeworld Gem created by Rebecca Sugar. Find out who is this powerful warrior and what’s she doing back on Earth. Team up for incredible combo moves and Gem Fusions. Fuse to play as Stevonnie, Smoky Quartz, Opal, Sardonyx, and Sugilite. Explore and interact with expansive 3D environments. Travel to ancient Gem locations all over the world, including Strawberry Battlefield, The Great North, and Bismuth’s Forge. If you get stuck in the game, check out the video walkthrough and gameplay for the game. This entry was posted in PC Games, Walkthrough and tagged Steven Universe: Save the Light Cheats, Steven Universe: Save the Light Game, Steven Universe: Save the Light Gameplay, Steven Universe: Save the Light Guide, Steven Universe: Save the Light Hints, Steven Universe: Save the Light Review, Steven Universe: Save the Light Solutions, Steven Universe: Save the Light Strategy, Steven Universe: Save the Light Tips, Steven Universe: Save the Light Walkthrough by Marvin. Bookmark the permalink.